Fake news? No, but Ben McAdams campaign says a fake reporter likely had ties to Mia Love campaign. Love camp denies it. (Chris Detrick | Tribune file photo) Salt Lake County Mayor Ben McAdams waves to the crowd during the Utah Pride Parade on Sunday, June 5, 2016. Call it a different kind of fake news. The congressional campaign of Democratic Salt Lake County Mayor Ben McAdams says a young woman falsely claiming to be a BuzzFeed reporter attended a July news conference and asked a question that might assist GOP attacks on him. Shannon Havlicak Grondel acknowledges she is not a reporter but says she did not claim to be. She said a McAdams volunteer asked where her work may be used, and she said the BuzzFeed Community platform — where rules allow the public to submit fun items, if they are not political. (Rick Egan | Tribune file photo) Salt Lake County Mayor Ben McAdams says a few words as South Salt Lake and other dignitaries met to break ground on construction of UTA’s S-Line double track project, on 300 East and 2233 South, Monday, June 11, 2018. It is not uncommon for opposing campaigns to attend and even record each other’s events, but falsely claiming to be a reporter to ask a question would be considered unethical under journalistic canons. Grondel graduated this year as a broadcast journalism student at Brigham Young University and now attends its law school. Her online résumé and Facebook page note that she previously was on the communications staff of the Utah House of Representatives; was an intern for the Fox News Channel in Washington; and was a TV reporter at KBYU. 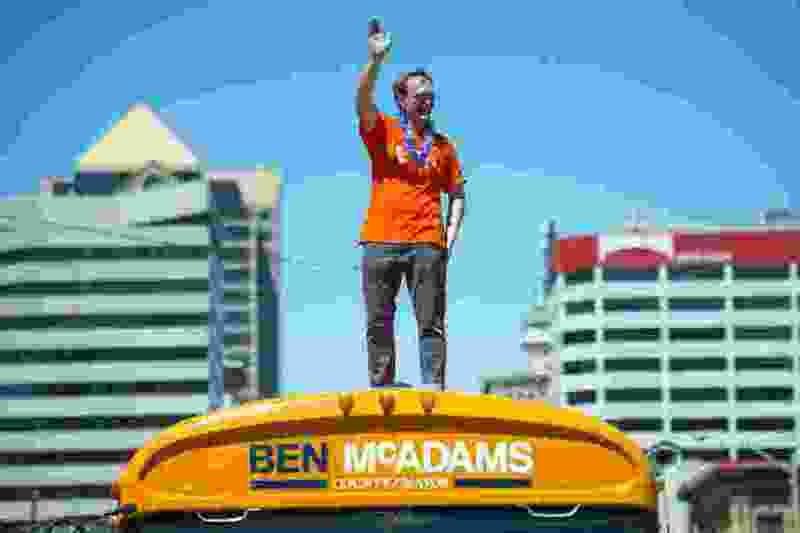 The controversy, first reported by KUER, arises from a July 10 news conference at the Utah Olympic Oval in Kearns, where McAdams launched a tour of the 4th Congressional District with his “Ben Bus,” an orange school bus he had used previously in his mayoral campaign. The Salt Lake Tribune did not attend the event. He then said his congressional campaign is renting the bus from his mayoral campaign fund “for fair market value.” The campaign later said that is $200 a month beginning in June (which the Love campaign subsequently said seems cheap and is the maximum that would not need to be itemized on disclosure forms). Heyrend said McAdams supporters figured “something wasn’t right” and that Grondel looked out of place. So she said a volunteer asked whom she worked for, and reported that she said BuzzFeed — and obtained her name and contact information. In McAdams’ recording, he at one point asks who she is as reporters are entering his bus, and the word “BuzzFeed” is heard — but it is unclear who said it. Grondel said in an email to The Tribune, “I never said to anyone that I was a BuzzFeed reporter … or anything of the like. I was asked where my article would end up and I told someone that I would be submitting it to the BuzzFeed Community." Grondel said she earlier wrote a story about donations to McAdams for BuzzFeed Community “where it got quite a bit of traction before being taken down for being too political in nature. As I continued my research into the campaign, I found a topic I could do a follow-up story on” — whether McAdams was properly funding his bus. Grondel said she actually did not write or send such a story to BuzzFeed or any other organization, because she became too busy with other matters, including a grandmother’s funeral. Dave Hansen, campaign manager for Love, said Grondel was neither a paid campaign worker nor a volunteer, and was not at the event at the behest of the Love campaign. He said Love’s spokeswoman, Sasha Clark, was there to watch it for Love. 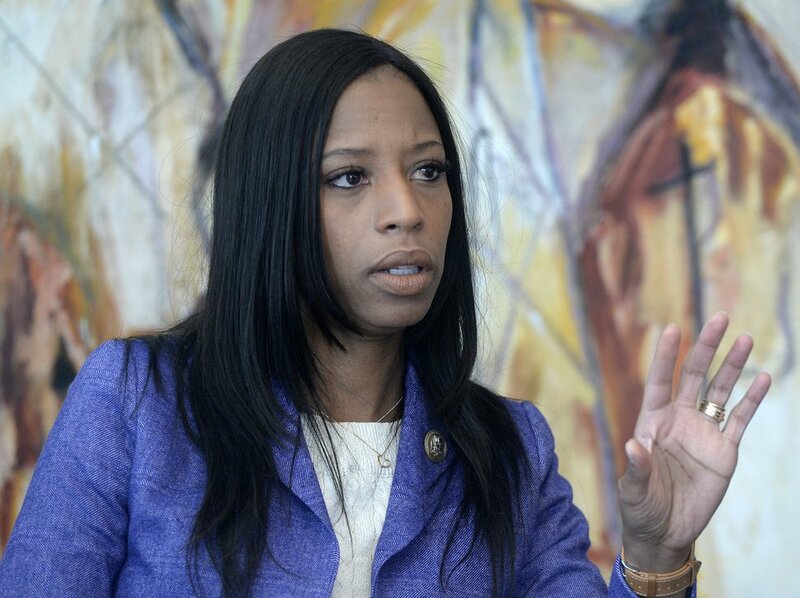 (Al Hartmann | The Salt Lake Tribune) Utah Congresswoman Mia Love speaks to the Salt Lake Tribune editorial board, Thursday, Feb. 22 2018. Heyrend said it is hard to believe that Grondel did not have ties to Love or the GOP because Miller, the head of the Salt Lake County Republican Party, later publicized that he filed an FEC complaint against McAdams asserting that he was violating election laws by not funding or reporting the bus properly — the subject of Grondel’s question.